California climate situation after Labor Day (the official end of summer in the U.S.): I have to report that it’s hot as hell. I‘ve never been in hell before but I can imagine it must be comparably as hot. Hellish members of mine can argue with me, but that will also reveal your “better don’t tell others” residence. For the first time after fifteen years of living in CA, I dipped in the Pacific Ocean and it felt cool instead of cold…Reporting from Manhattan Beach, CA. How’s everyone else doing in your part of the world? I’ve been cooking less and less stir-fry because I don’t want to stand in front of the heat if I can avoid it. The recipe today is also from a reader’s request that I have been putting off. I hope you didn’t give up on me just yet. Here I am now, writing about it. This dish is called “Guay Tiew Kua Gai” Guay Tiew=noodles (if you’ve followed me long enough, you should know this word by now. ), Kua=roast, Gai=chicken. This is different than other noodle stir-frys such as Drunken Noodles, Pad Kee Mao, Pad See Ew or Pad Thai. Can you tell what makes this dish different? If you remember some Thai words and detect it right away, good for you. If you’re still perplexed, here is the answer. 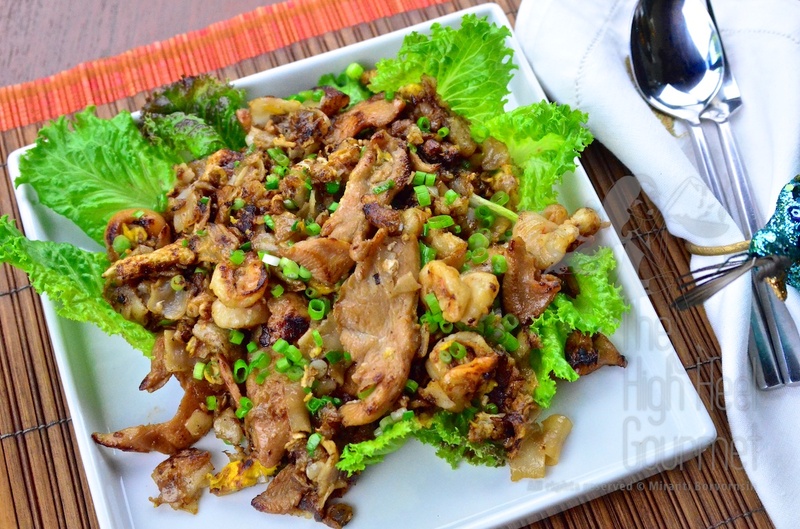 This noodle dish is called “Kua,” or roasted, not “Pad,” for stir-fry. You might have some more questions now. How can we roast noodles? How can we roast them in a wok with oil? Kua in Thai is the verb denoting that we either toss something in wok until it dries—either with or without oil—but has to be performed in a wok or pan. Roasting as you know it is done without using a wok or pan, but the Thais would call that “Yang,” or grilled. So that should reveal how the dish should come out, right? A dish of dried noodles with chicken mixed in. In fact, we do have more than just chicken. 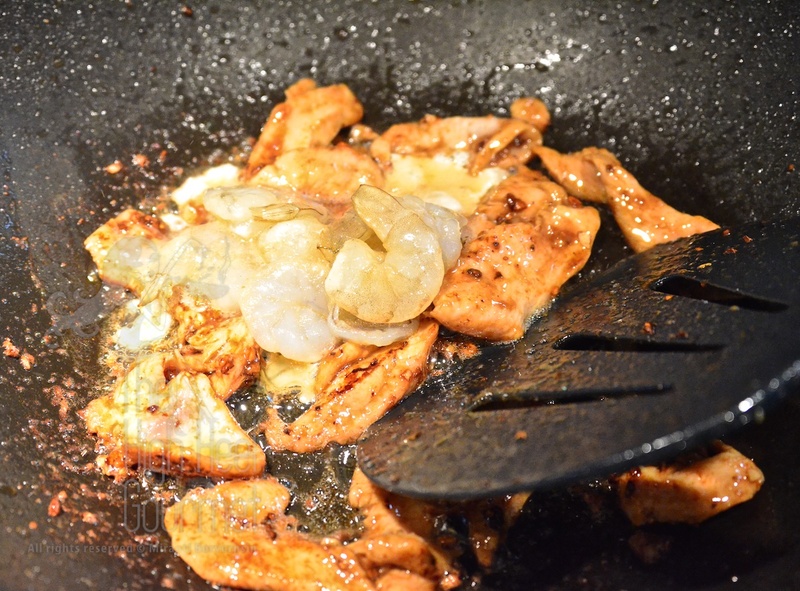 This dish will contain pieces of calamari or squid that has been soaked in alkaline until the texture of the meat changes slightly, and the color changes drastically. Seafood went rotten really fast in the old times before refrigerators. Remember, even though the refrigeration technology had been patented since 1856, it took another 60-70 years to become available for the household use, and we didn’t even have the closet-sized fridge the way we have now. We only had a small box, very tiny compared to the refrigerators available these days. People in the old time found a way to preserve their fresh-caught seafood by either drying them in the sun, soaking them in salt or keeping them in acid or alkaline that discouraged or killed the bacteria that wanted to eat your seafood before you did. The Chinese, who invented the way to preserve squid by soaking them in the high alkaline solvent made from calcium hydroxide Ca(OH)2 dissolved in water, are the ones who invented this dish as well. I have to admit that this was not my favorite dish at all until I became a grown up and got to eat a really good preparation. I don’t like the texture of squid, and my favorite kind of meat is never a chicken, ever. Well, I do like fried chicken, but I don’t normally choose to eat chicken that isn’t fried as my first choice. That is, until I discovered the real Guay Tiew Kua Gai in Chinatown, Bangkok. The vendor, who was a street-side vendor, took more than half an hour from the time I ordered to the time I got the dish in front of me. It didn’t look like the Guay Tiew Kua Gai that I knew before at all. The noodles not only smelled so delicious from the Maillard reaction, but there was also the aroma of the pan itself (yes, from the wok that has been used over and over, coated with yummy food smell; all Asians know what I’m talking about), and the charcoal flavor mixed all in. Once I took the first bite the noodles won me over, crispy on the outside but still soft and tender on the inside. The chicken was just perfectly evenly cooked, and though the noodles took so long to cook, they just calculated the timing to cook this dish so well. The fresh crisp lettuce also added the texture and contrast to the flavor. It was just perfect! Well, if you’ve ever been in Thailand, you probably saw them cooking this stir-fried noodle dish on the street in the city, but how can you tell the good one from the average to the bad, to the untouchable, so really, really bad that I have to warn you not to even look at them? Guay Tiew Kua always uses Chow Fun or big fat rice noodles, and never any other kind. This rice noodle is a mix of rice flour and tapioca flour, in various ratios of rice to tapioca flour, ranging from 70:30 to 95:5. Very rarely can you find noodles of 100% rice flour, to the point where you almost have to make your own. There is a reason behind the percentage of rice flour in the noodles. Rice noodles will give a crispy texture when fried with oil at a high temperature, but the tapioca flour will give a chewy texture or stickiness to the noodles. The serious vendors who sell only Guay Tiew Kua will seek out the noodles that contain 100% rice, if they can. I used whatever I could find in the Asian market, so it is a mix between rice flour and tapioca flour, but I can work with it. You will be able to also, with my method. You’re starting to get the idea about the good Guay Tiew Kua Gai at this point, right? The good Guay Tiew Kua Gai is going to have some crispy spots on the noodles. Not burned spots, but they have to be crispy. Set the quality apart from the average one which only taste just like the stir-fry noodles like the Pad Kee Mao or Pad See Ew and the really, really good one is going to be ALL crispy noodles. I’m not making that really, really good one because it takes so long and it takes so much oil to make. I also want you to be aware about the bad one. 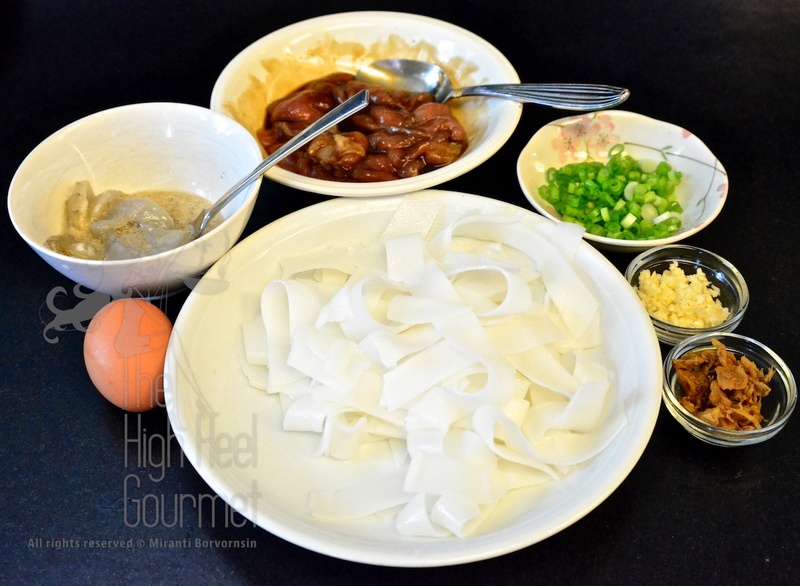 The noodles will be so WHITE that some are not even dry, with egg slopped all over them and some of them even fishy beyond belief because the egg wasn’t cooked, almost like you just added scramble eggs into stir-fried noodles! It raises the barf factor up to 10! I’ve been talking more about the noodles, but actually the chicken is important, too. Can you imagine how the chicken pieces are going to tolerate the heat used to cook the noodles without transforming them from a piece of chicken into a piece of rubber? The chicken has to be cut to the right size, in general bigger pieces than bite size. The technique to cook this dish combines oil and patience. Go practice your patience and come back. Then we will start cooking. (Optional) Sriracha sauce or chili sauce, the one made in Thailand, NOT the name stealer with the lone chicken brand with green tips. IMPORTANT you should only cook one or two servings at a time, not more. If you are not using a wok and use 12” pan instead, then JUST ONE SERVING AT A TIME ONLY. 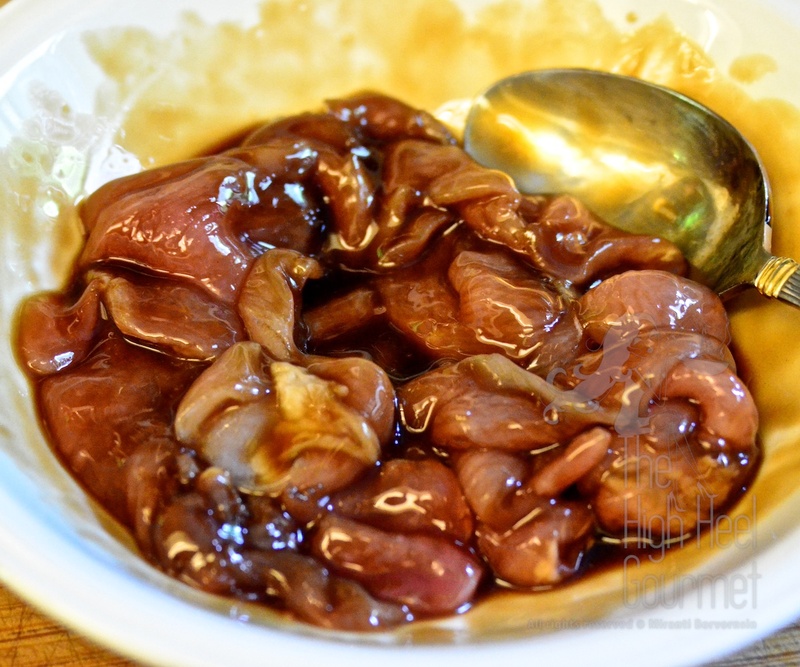 1) Marinate the chicken with the oyster sauce and the seasoning sauce. Leave the chicken in the marinade at least 15 minutes. 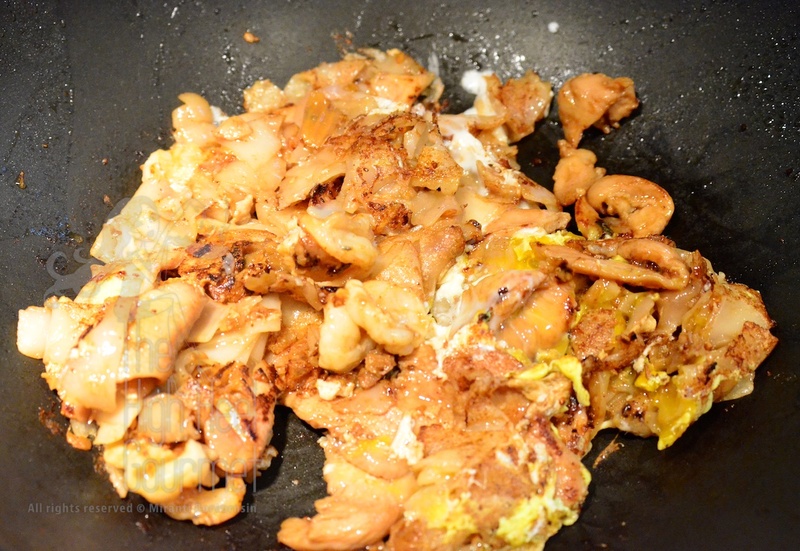 I also marinate the shrimp with sesame oil, egg white and a dash of light soy sauce, too. 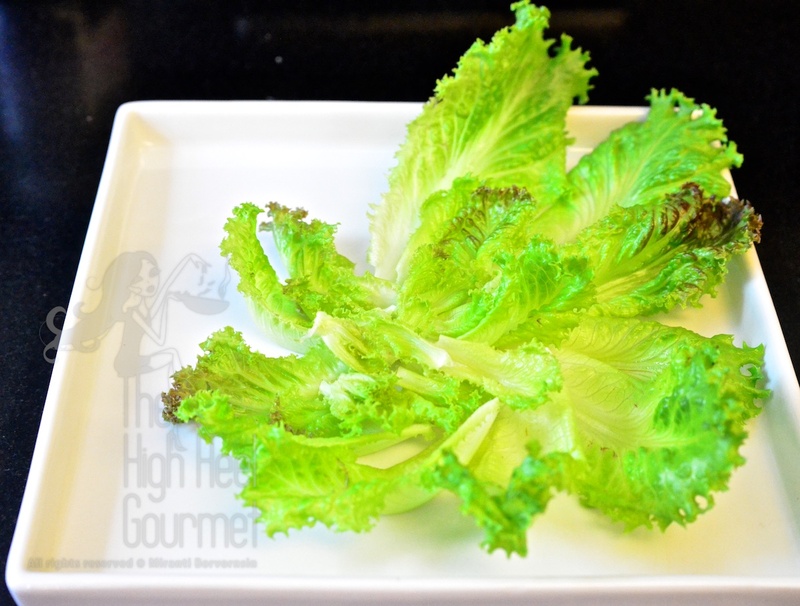 2) Wash and cut the lettuce, arrange them nicely on the plate. Remember, I told you don’t start cooking without the lettuce. 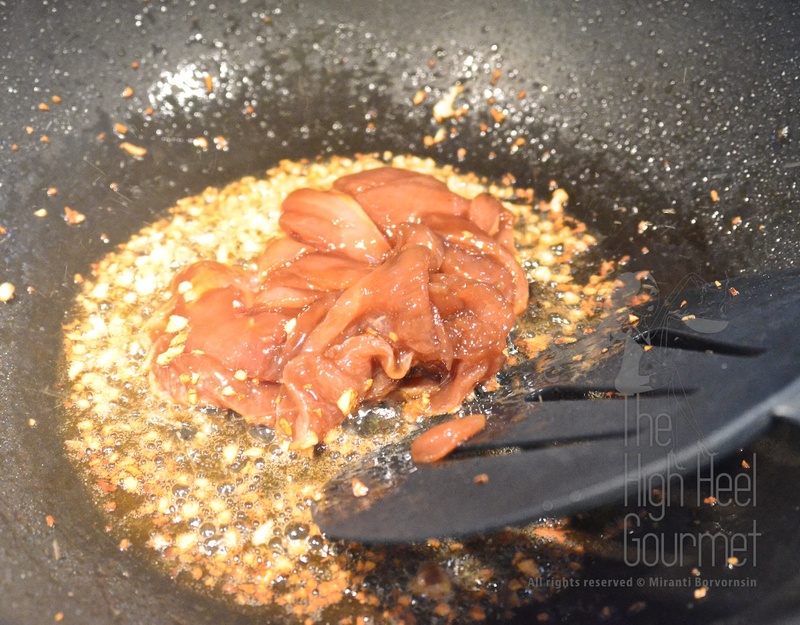 3) Put at least 2-3 tablespoons of oil in the wok. I told you to practice being patient, so start using it now. You MUST wait until you see the smoke come out from the wok. 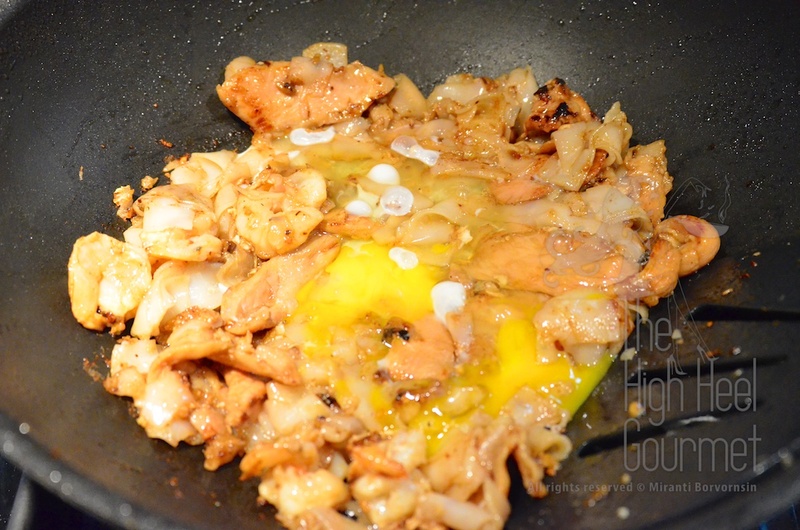 4) Add chopped garlic to the wok, flipping it around a few times REALLY FAST. flip them around FAST until the outside of chicken pieces are cooked. It shouldn’t take more than one minute, but if it does, it’s okay. and before you even flip them around, add the noodles too. Toss them with all the sauce and the oil. Make sure they’re coated in oil. 7) Spread the contents around the wok. We want the noodles touching the surface of the hot wok as much as possible. Then you practice WAITING again. 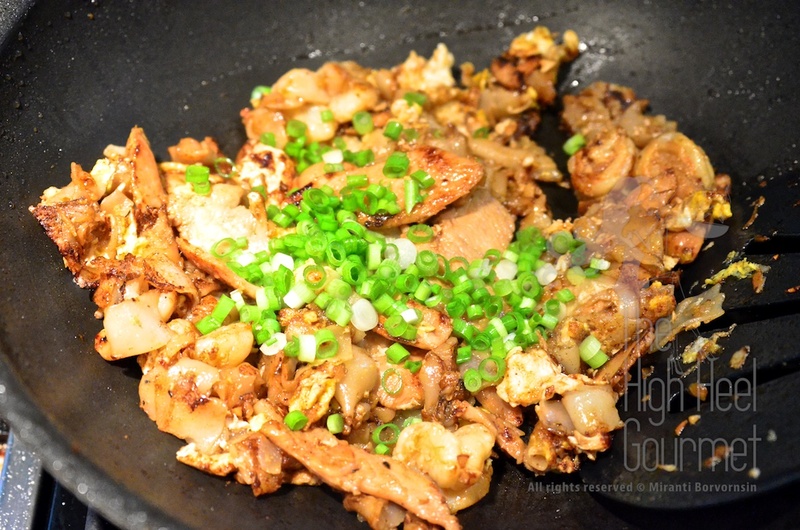 You leave the contents in the wok ALONE, and watch them sizzling in the wok for at least full one minute or longer. You can lift the bottom to see if there are some crispy spots on the noodles yet, but don’t flip or push the noodles around. If you see that the noodles aren’t sizzling in the wok, drizzle more oil around the edge of the wok, but not on the noodles. You do it on the side so the oil flows to the bottom of the noodle pile. then you can flip. You want to flip the top all the way to the bottom in one big hunk. 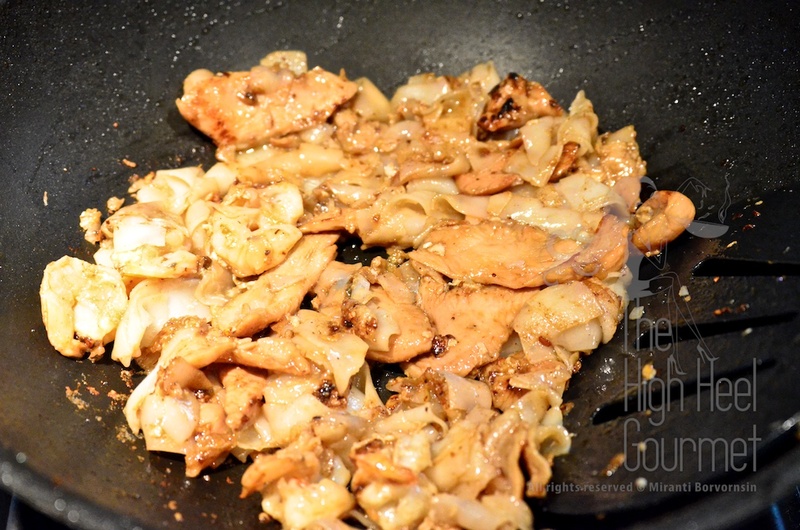 9) Drizzle more oil on the edge of the pan and let the oil flow to the bottom of the noodle pile. WAIT again. DON’T TOUCH THEM. You have to let the wok, the oil and the heat do the work for you. Some very famous vendor in Chinatown, Bangkok who’s only selling this one dish and nothing else, can take up to 15 minutes to make this dish and their noodles are all crispy. It’s pretty much a fried noodles dish, not even “Kua”, you know. They keep drizzling the oil and waiting, adding more oil and waiting. At the end, they’ve got the most delicious noodles, full of wok smell, crispy on the outside and still soft and chewy on the inside, mixed with the seasoning. So delicious. and toss them together. You can add sugar now and toss them together. Remember do not add sugar until the end. Sugar will make the noodles burnt instead of crispy. 12) Put the hot noodles on top of the lettuce that you arranged on the plate and serve it with a little bowl of Sriracha sauce. This entry was posted in Chicken, Chinese, Clicking in the Kitchen, Comfort Food, Dinner, Gluten Free, Lunch, Noodles, Noodles, Snack, Stir fry, Thai, Thai Noodles and tagged Asian, Chicken, Chinese food, Cooking, Easy recipes, Egg, Food, gluten free, Noodles, Recipe, shrimp, Stir fry, Thai food. Bookmark the permalink. what type of wok are you using (non stick)? where can I get one? Calphalon has a good one. If you want cast iron, Le Creuset has a no-stick wok and Lodge also has a nice wok but you need to season it yourself. My favorite is the Lodge. I also use IKEA wok too. It doesn’t matter Calphalon or IKEA, when you cook with such an extremely high heat, the wok won’t last very long. So go for whatever you can afford. The important part is the heat and the speed. Thanks for your input. I am going to purchase the lodge. Last question. What type of spatula would you recommend for the lodge wok? I like wooden spoon or wooden spatula but I don’t like the American one. I like the Asian style. It is wider at the end suite for quick flipping. But I think this is personal preference. I’m use to Asian style. My friend use the salad spoon and it works for him. XO have a silicone wide tip one too. I think they meant for flipping pancake but it works for stir fry in the wok for me. It can flip the large amount all at once because I can’t shake the wok. Is there any particular brand of wooden spatula? No particular brand. But personally I don’t like the white soft wood because it’s absorb too much flavors. What a brilliant colorful dish– I would love to try it!! Wow your site is so great! Really amazing! So many good recipes. Can’t wait to try them out! RuthAnn at inspiringcuisine.com says, I’m an advocate of how valuable it is to set aside time to cook thoughtfully for our families and guests. Yes, it’s nice sometimes to be able to cook quickly, but lingering over fragrances and techniques will usually produces a finer dish. I’m looking forward to trying Rice Noodles stir-fried with Chicken. Nice detailed description of the cooking technique. The alkaline soaked calamari sounds interesting. This looks phenomenal. I need to give this a try!